HMS Vernon (R) made for an easy target for enemy aircraft and its proximity to the beach gave cause for concern; armed sentries patrolled the perimeter of the site day and night, whilst the duty watch manned sentry posts at entrances. The various instructional sites in the town also had sentries posted, a duty which fell to junior rates at the establishment – at least once during their time there, trainees being utilised as security manpower when not under instruction. The threats of attack from a U-Boat landing party was taken seriously, and regular exercises were held against this eventuality- luckily none ever materialised. During early 1944 the Army Divisional Commander, Lieutenant General Montgomery, visited HMS Vern on to advice on the defences; he had a few words for the Vernon civilians who he had encountered when they were on Home Guard sentry duty. There were few instances of enemy action affecting HMS Vernon with the exception of ‘tip and run’ aircraft attacks, machine gun rounds and cannon shells caused some casualties. One rating was killed whilst he sat in the canteen at St. Dunstan’s, hit be a single stray bullet from a machine gun, another was injured when he was hit in the knee by a cannon shell, this chap was lucky, the shell failed to detonate, he recovered in hospital. Bomb damage to Marine Gate saw two fatalities, a Sub-Lieutenant, and an officer’s wife were killed in one of many raids which damaged the block of flats; the building was eventually deemed unsafe later in the war and evacuated until repairs could be made. One of the Vernon (R) civilian Draughtsmen went missing early on the afternoon of May 25th 1943, he had been walking on the cliff after lunch but was never seen again; this was the day of a major air raid on Brighton and it was feared that the man was hit by enemy fire and fell into the sea. At just after noon, Captain Egerton, who was due to be relieved by Captain Harold Morse, RN DSO on June 4th, was on the Quarterdeck along with the ship’s officers gathering for a group photograph to mark his leaving. While the assembled officers were being lined up for the shot the air-raid siren went of. No one took any notice until they saw about a dozen planes flying due west, below the level of the cliff at wave top height, heading towards Brighton. The group scattered as another dozen aircraft which had approached the back of the school over the downs roared over them; these were so low that the colour of the bombs in the racks could be clearly seen. There were a few cannon shell fired as they sped past but no casualties were incurred at Roedean. The daylight raid by 25 enemy aircraft was over in just six minutes – twenty four people died and over 130 were injured in Brighton’s worst bombing raid of the war. The nearest bombs to Roedean School hit the Black Rock gasworks setting gas attenuators ablaze, Preston Park Pullman Workshops were damaged and London Road viaduct was also hit bringing south coast rail traffic to a halt. Several residential areas were hit by bombs. One attacker, a Focke-Wulf 190 was shot down by 8 Battery, 2 Canadian Heavy Anti Aircraft Regiment sited on the Roedean golf course just west of Roedean School, the aircraft crashed into the sea at 12:22 pm. The other airborne threat to approach from the sea was the V1 “Doodle bugs” or “Buzz bombs” which began to fly over from northern France beginning on June 13th 1944. Although none fell to earth at any HMS Vernon site (one did fall on Saltdean) they were often observed flying overhead on their way inland. Many naval ratings saw their first V1 through the windows of the St. Dunstan’s Building which offered an exceptional vantage point from its glass fronted ‘cockpit’. A Lewis machine gun was mounted on top of St. Dunstan’s and manned when V1s were heard in the hope of a lucky hit knocking one off course or destroying it. On June 6th 1944, D-Day, the flagstaff flew a No.1 White Ensign (a 9 x 11 ft flag) in honour of the men about to land on the Normandy beaches, those who were there on that day remember seeing wave after wave of ships going down the Channel on their way to France. Captain Norman Grace, who took over command of Vernon 1n September 1944, presented the Ensign to the Head Mistress when Vernon moved back to Portsmouth, and this was hung in the School’s chapel in a place of honour. 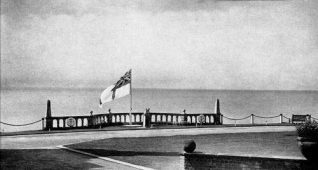 May 8th 1945 marked the end of the war in Europe and both Roedean School and HMS Vernon turned their attention to returning to normality. 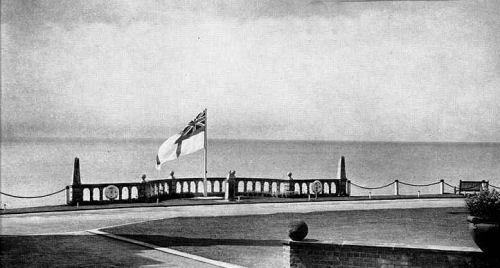 The need for dispersed military bases and schools and children evacuated from the densely populated areas of war-time Britain had come to an end; June 7th 1945, was the last day of naval instruction at Roedean. HMS Vernon began the move back to Portsmouth the next day; the operation involved ninety-two 5 ton lorry loads and was completed in just over a month. By mid July the various sites occupied around Brighton and Sussex were being cleaned up and prepared for return to heir civilian owners. Roedean was reopened as a girls’ school in January 1946. I was a radar technician in REME on detachment to the Canadian HAA battery at Black Rock during the air raid in May 1943. Although the guns were in action the FW190s were too low and fast for HAA tracking. I clearly saw the plane shot down off the golf course but it was shot down by a Spitfire (Hurricane?) directly over the gun-site which was showered by spent cartridges from the fighter.